3D TV ? Next Revolution in TV Viewing.. The era of the ‘Third Dimension’, seems to have finally arrived, enthralling audiences and challenging manufacturers. 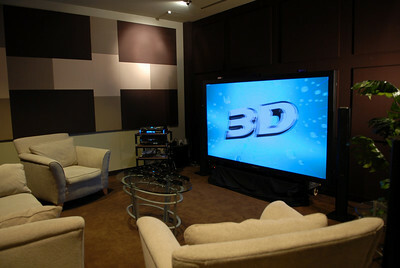 The year 2010 will see 3D TVs, which have largely been concepts so far, go mainstream. In fact, the recently-held CES saw a rage for 3D technology, with everything from 3D projectors to 3D glasses to 3D camcorders lapped up by the audience. To be honest 3D Television is not a new concept at all it employs some technique of 3D presentation, such as stereoscopic capture, multi-view capture, or 2D plus depth, and a 3D display – a special viewing device to project a television program into a realistic three-dimensional field. Occasional 3D episodes became moderately popular in the late 1990s when several shows used the technique to attract viewers and increase ratings. So how does a 3D TV work ? To see 3D, each eye needs to see a slightly different image, just like in real life. So a 3D TV uses a lenticular lenses assembled on top of the LCD-panel, to project a different image in your left and right-eye. Using both images, your brain then creates the 3D experience. 3D principle has been around for over 150 years (photo) and 80 years (film). Because of recent developments, it is now possible to provide a high-quality 3D experience without the need to wear special glasses. Other developments in technology boost developments in 3D, such as; availability of content in digital format, HD technology all over the place, and signal processing performance. This all will enable bringing 3D to mass markets, and could have an impact that is comparable with transition black and white to colour. It is known that in some cases people have difficulties to perceive depth. Nevertheless, even viewers who are not able to see 3D from stereoscopic images can still perceive and enjoy 3D while moving within the multi-views of the 3D displays. Panasonic unveiled the world’s largest HD 3D Plasma display. Standing tall and slim at 150 inches in size, the 3D TV offers a 1080p HD 3D display. It was declared the winner in the ‘Best of CES’ category and also in ‘Best in Television’ category at CES. The 3D TV from Panasonic comes with a pair of 3D shutter glasses with a battery life of 250 hours of viewing. The glasses automatically turn off in case they don’t detect signal from the emitters. Panasonic 3D TV series include TC-P50VT20 (50 inch); TC-P50VT25 (50 inch); TC-P54VT25 (54 inch); TC-P58VT25 (58 inch); and TC-P65VT25 (65 inch).Panasonic also launched 3D Blu-ray player and a 3D camcorder as part of its home theater set. Panasonic TC-PVT25 series is set for a second quarter release. The year 2010 will see a host of 3D TV launches from Sony in its popular Bravia range, Sony Bravia LX900 series. Sony 3D TV offers features like built–in wi-fi, intelligent presence sensor and the Edge LED backlight. Sony, which has teamed up with IMAX and Discovery, also plans to launch a dedicated 3D TV channel. Sony has taken the 3D experience to gaming arena as well and says that users can play 3D games on a PS3 console. Sony 3D TV sizes include XBR-60LX900 (60 inch), XBR-52LX900 (52 inch), XBR-46LX900 (46 inch), and XBR-40LX900 (40 inch). Toshiba seems to have taken a slightly different path with its 3D TV launch. The company announced Cell TV, a full-blown Internet TV, which also offers 3D content. When 3D content isn’t available, Toshiba’s new converter would convert any kind of 2D content- games, movies or sports – into real-time 3D. The television offers video conferencing with built-in microphone and a video camera. Cell TV also offers users the capability to download streaming content from internet. Samsung unveiled 3D-ready DLP HD Television series. The size of the HD TV is 55 inches, and claims up to 1080p of speed. What makes the Samsung 3D TV stand out is its thinness with other on the camp. LG too showcased its 3D TV range, Infinia LED HDTV series. LG LE9500, the company’s flagship model in the 3D range, is available in 55 and 47 inch models. With a depth of just 0.92 inches, LG LE9500 can be ranked among the slimmest 3D TVs. The TV comes with integrated wi-fi system, and offers Skype and DivX technologies. Last week I blogged about “Apple – iSlate” tablet, It is still speculative though if Apple will launch a Tablet PC on January 27 or not. However, a slew of products are already ready to steal Apple Tablet’s thunder (if it gets launched). Aiming to bridge the gap between smartphones and laptops, this new novel category of mobile devices has suddenly swamped the technology industry. Hewlett Packard, Microsoft, Dell, Motorola, Asus, MSI and Lenovo are among a barrage of companies showing off these thin, touchscreen, multimedia devices at the ongoing Consumer Electronics Show (CES) in Las Vegas. In terms of functionality, these wireless gadgets — called Slate or Tablet — can broadly stream video, download music, surf the Web and play games. Here’s looking into some of the hottest Tablets unveiled at CES. Motorola Inc demonstrated a prototype media tablet that could be ready commercially by the fourth quarter. The prototype has a 7-inch screen, runs on Google Inc’s Android operating system, and has room for 32 gigabytes of external memory. It carries a chip from Nvidia Corp and a modem from Motorola. We can anticipate it being a $300 device In CES it was demonstrated how the tablet could stream movie trailers wirelessly, and said the device could also download and store video to watch later. Dell Inc showed off a small slate computer that it could bring to market this year, exploring yet another type of device designed for computing on the go. Dell’s Slate has a 5-inch screen and runs on Google Inc’s Android mobile operating system. Dell declined to provide other details, or say definitively if the new gadget, which looks like a large smartphone, would hit the market. Dell as i remember also recently released its first smartphone, the Mini 3, which is on sale in China and Brazil. Lenovo unveiled IdeaPad U1, a hybrid tablet/laptop. Lenovo IdeaPad U1 features a detachable slate-style tablet screen. With the screen attached to the laptop base the IdeaPad U1 is powered by an Intel CULV processor, but when detached it becomes a tablet smartbook powered by Qualcomm’s Snapdragon 1GHz processor. Microsoft Corp Chief Executive Steve Ballmer unveiled a new Hewlett-Packard Co Tablet computer. The Tablet — also known as a Slate, is a multitouch touchscreen one-piece portable computer without a physical keyboard. Ballmer said the HP tablet will be available later this year. 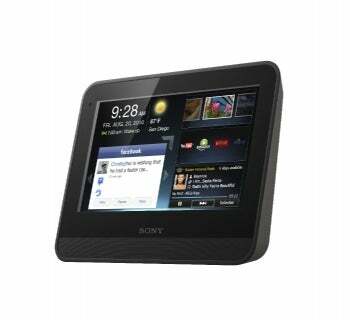 He also gave a glimpse of two similar devices from Archos and Pegatron Corp.
Sony launched Dash, a tablet-like device which the company calls a “personal Internet viewer” at the CES. The device costs $199, and has approximately a 7-inch screen that gives users access to over 1,000 specially written Internet applications, for news, calendaring, weather, sports, social networking and more. Dash also has built-in stereo speakers as well as a USB port so that users can transfer content to it from their PCs. Within the device, an internal accelerometer allows for two viewing angles: upright, ideal for a table or nightstand; and tilted, perfect for a countertop. The main difference between Dash and other tablets, like the Lenovo IdeaPad U1 is that Dash does not run on an OS. Sony Dash is more of a large touchscreen portable media player than a computer. Asus plans to launch its 10 inch Tablet-style netbook this year. The company first showed off the Eee PC T101 at CES 2008. Since then the device has undergone some changes and the new version looks slicker. Eee PC T101MT has a 1.6GHz Intel Atom N450 Pine Trail processor, and it can run Windows 7 Starter or Home Premium. The Starter version will come with 1GB of RAM, and a 160GB hard drive, while the higher end model will pack a 320 GB HDD and 2GB of RAM. Users will also get 802.11b/g/n WiFi, Bluetooth, and a 35 hr battery that Asus claims is good for up to 6.5 hours of run time. 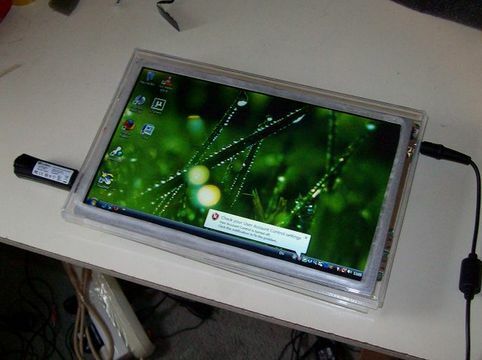 The Tablet PC has a capacitative multitouch display. MSI demoed two new touchscreen concpet notebook tablets at show that could hit the shelves as soon as June. The dual screen notebook, as it is currently called, runs Windows 7, and offers a 10-inch dual touch panel with virtual keyboard and ebook experience according to the Taiwanese company. Storage is offered via SSD and the processor is Intel’s Melow low power solution.